Melitta is a well-known name in the coffee machine market. The original Melitta Caffeo Barista consistently ranked highly in the bean to cup reviews since 2015. That wasn’t enough for Melitta, though, so they decided to produce the Melitta Caffeo Barista TS as an upgrade. With a slightly higher price tag, this new version of has performed even better than the original, which is why it’s boasting a four-star rating on Amazon and often higher on other retail sites. Let’s review why. What is good about this fully Automatic Coffee machine? A bean to cup machine is all about enjoying freshly ground coffee without the fuss of undertaking the whole process yourself. That’s exactly what the Melitta Caffeo Barista TS offers. This bean to cup machine boasts a far more than adequate 21 different preset coffee recipes. While it specialises in espresso, ristretto and lungo, you can also expect to enjoy high quality Americano, caffè creme, cappuccino and latte macchiatos. In addition, it can create chai and cold lattes, for when you fancy a change from the ordinary. And all this at the touch of a button or two. As if 21 preset recipes weren’t enough for anyone, there’s also a four recipe My Coffee Memory function, in case your preferences are different from the standard. Save up to four individual recipes, which are easily accessed through the ‘My Recipes’ button. Setting your preferences is easy too, thanks to the TFT screen and innovative ‘Touch and Slide’ function. The touch screen has a wide range of buttons, but they’re all clearly marked, making it easy to identify exactly what you’re choosing. There’s also a clear, full colour TFT screen, which details everything you could possibly want to know about your coffee. This includes which bean hopper you’ve selected, the type of coffee you’ve chosen, the volume of coffee and milk in your cup, and the intensity of strength. The ‘Touch and Slide’ function makes setting your preferences simple too. As the name suggests, just touch the option you want to change, and move your finger along to choose your options. This Melitta bean to cup machine holder can take cups up to 13.5cm (5.3 inches) tall, making it tall enough for latte cups and mugs. The dispenser easily slides up and down to adjust from espresso height to latte glass. How much coffee does it hold? The airtight, double-chambered bean hopper holds 250g of coffee beans. That’s 125g per compartment. You can actually use two different bean types, as this machine allows you to select which hopper you wish to grind from. This Melitta Caffeo Barista holds a generous 1.8 litres of water. That’s enough to brew coffee for a room full of coffee lovers before you need to refill. This is a tricky one. There really isn’t much to criticise. The one slight issue some users have raised is that the instruction manual isn’t as clear as it could be. And with so much functionality, using the more advanced features could mean having to refer back to the instructions on more than one occasion. Some users also report that the drip tray is difficult to empty without spillages thanks to its size; it runs the entire length of the coffee machine. But, as we said, these are pretty minor problems to have. This bean to cup coffee machine is easy to clean. The descaling, rinsing and cleaning programmes are fully automated, while the TFT screen guides you through the cleaning functions. The milk system reminds you to rinse it through after every use. This is also easy to do: just attach the milk tube to the drip tray for a quick steam clean. How functional is this machine? In addition to the extensive preset menu, the this Melitta Caffeo machine allows you to find your own coffee pathway without too much fuss. It offers almost complete controllability over your coffee. There are five strength settings. Length can range from 30ml to 220ml. Temperature can also be switched from normal to high. Then you can decide how much milk you want. And the My Coffee Memory allows you to store your four favourite recipes so you can enjoy your perfect cup every time. Again, there’s not much to say really. 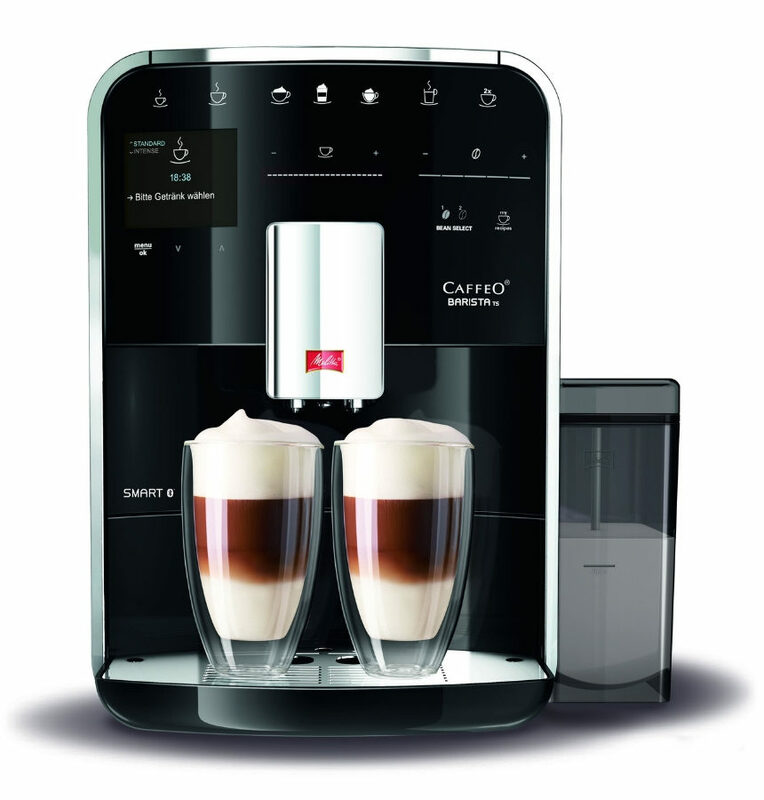 After all, with it producing everything from espresso to cappuccino to chai and cold lattes, plus four programmable options, what else could you need? In addition to its wide functionality, the milk system is an additional feature. Unlike some bean to cup machines, the milk tank is freestanding. This enables easy emptying and cleaning, which is especially handy if you’ve forgotten to empty it. The integrated milk frother also receives high praise for the particularly rich, creamy foamed milk it produces, making it just as good at making cappuccinos, lattes and caffè creme as it is at espressos and Americanos. It also offers dual dispensing of all coffee types, making it ideal for when you’re catering for a crowd. And should your beans be running low, it lets you know. This Melitta Caffeo offers some temperature control. You can switch from normal temperature (around 57℃) up to high (63℃). This bean to cup coffee machine has a professional level 15 bar water pressure that ensures a rich, thick crema every cup. It’s a stylish looking machine that combines black plastic and chrome finish for a high-quality gloss finish. The extensive range of buttons don’t look crowded or clunky thanks to the fact that they’re a touch on the sensitive side. The Melitta Caffeo Barista TS isn’t the cheapest bean to cup coffee machine out there but, for the price tag, you’re getting a whole load of options. Twenty-one coffee options to be precise. And with clear information, thanks to the TFT screen and touch button functionality, wrapped up in a stylish package, what’s not to like?